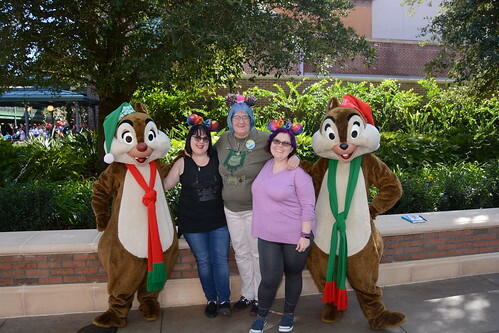 After the big 10th anniversary trip to Walt Disney World, we took a break in 2018 from an organized guild meet-up. I know a few people got together on their own, but a big event just wasn't in the cards. I need a break from running these things. Fortunately, Wendrah and Zylostout have offered to host a party at their house. We will be meeting on Saturday, July 6th around 3:30-4:00 p.m., and staying until 9:30-10:00. They are located in Goodwood, Ontario, Canada. You can see -- on the above map -- that it's northeast of Toronto. If you are coming from the US, you MUST have a valid passport to enter into Canada. Look what I did today. My hair is currently cobalt blue and it was important to have my passport photo reflect blue hair. Anyway, if you are thinking of coming, get your passport now. Go to your local post office and pick up the forms. Get your photo taken and fill out the forms. It can take 6 weeks to obtain one and, unfortunately, there's a lot of problems with some people getting passports. Doing it now will mean if there is any question about the form, you have time to rectify it. There are a number of hotels in the area so, if you are interested in coming, Zylo, Wen, or me, can email you a list of accommodations. I intend on being there. I'm just not sure when I'm leaving Chicago. I need to do some genealogy stuff in Michigan so I'm not sure if I will do it before or after the event. We picked July 6th because of the July 4th holiday. We thought some of you might take July 5th off and make a long weekend of it. There are a lot of things to do in the Toronto area including the Toronto Zoo and Niagra Falls. Beyond going to Zylo and Wen's, we haven't decided if we are doing anything else but will make a decision at the end of May. Now for another travel item. Several of you are interested in Star Wars Land, which opens in the fall of 2019 at Disney World. I was at Disney in November. 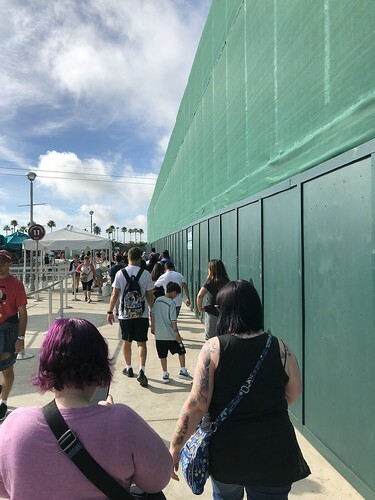 Behind this green wall is the construction of a brand new transportation hub at Hollywood Studios. (That's Faience on the left and Flinka on the right.) 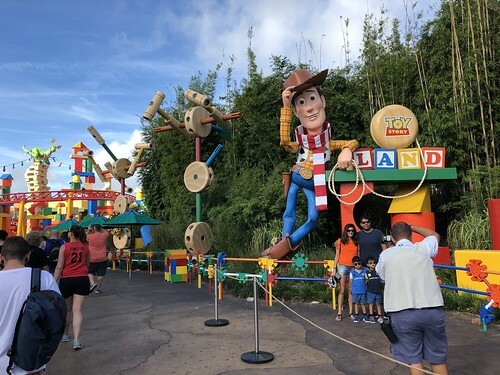 It's all part of an expansion of Hollywood which has seen the opening of Toy Story Land. We didn't ride the Slinky Dog roller coaster as the only times we could get Fast Passes were when we had other things planned, but it looks fun. I was not going to stand in line for 90 minutes. My time limit is 45 minutes. We did eat breakfast at Woody's Lunchbox. It was good. The area was packed so we didn't wander about. We got breakfast and then headed to the Rock 'n Roller coaster. Star Wars Land is being built over by Muppet 3D and the Star Tours area. Oh wait. These guys aren't from Star Wars, but they were over by one of the future entries into this land. Ironically, the official Disney photographer who was doing Dale 'n Chip's (That's how they are standing.) photos also turned to his right and took official photos by the future entry. Here we are using the force. What do you mean "That's not how it works."? 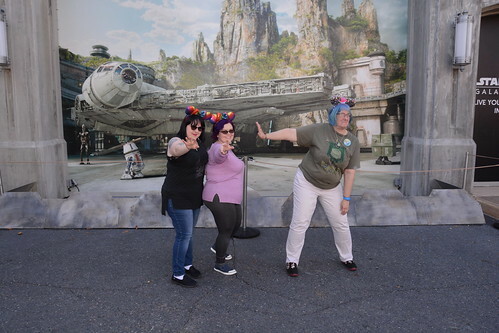 Because several of you have asked, I'm putting up a poll to the left about whether you would be interested in another guild trip to Disney World in 2020; probably fall, like we did in 2017. This would be, roughly, a year after Star Wars Land opens and that might lessen the crowds somewhat. 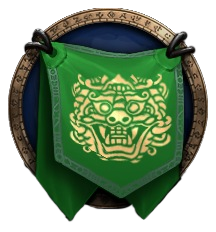 The poll is found AFTER the Legacy Raiding poll. You need to click "Next Poll" at the bottom right corner. I will utilize the services of our great travel agent, Hollie Holmes. As with 2017, we'd have a character breakfast, a "goodbye" dinner, and do the Halloween party UNLESS you think you want to go during the Flower and Garden Festival in March. Having done both, it's worth it to attend these special parties. They are an extra $100 on top of all other fees. The poll will be up for a month, so you have time to think about it. At the July meet-up, I can provide estimated costs and deadlines for payment. I'll also make a selection of resorts. It was nice to stay together. There are deals at a lot of the resorts for fall -- except at French Quarter. /sigh It never goes on sale. I liked the resort, a lot, but maybe we want to go somewhere else. 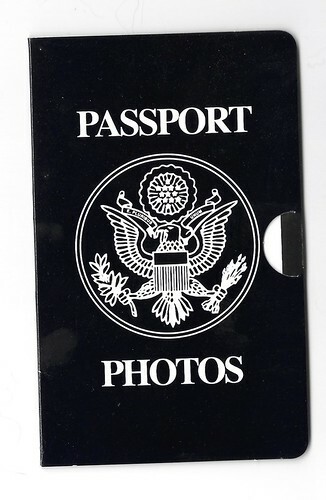 So, step 1: Get your passport so you can come to the July meet-up. If you know for sure you're coming or if you think you will try, please comment so Wen and Zylo have something of a head count. Step 2: Think about another WDW guild trip. 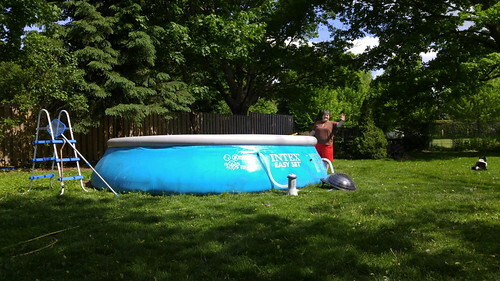 I won't have cost numbers until July so the emphasis is on splashing in the pool at Zylo and Wen's. Yes, both events are family friendly. We promise not to crack too many off-color jokes. If you have questions, post them here. I'll do my best to answer them.